The results of our work with them suggested that the couple were very creative which led them to enrol on a fine furniture course which was based in Sussex and they both received training from one of the UK's most skilled and successful producers of fine furniture. Steve and Berta as part of the course had to produce a number of practice pieces of furniture and very kindly asked, as a thank you to us for our help, could they make something for Changekey. Of course we said yes! 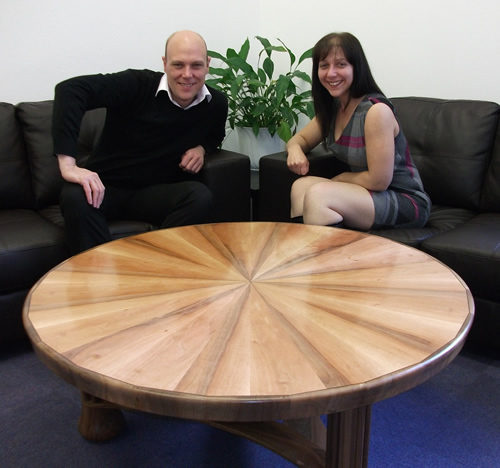 and the photograph of Steve, Berta and the table was the outcome.